The law of attraction is not a rule, or something you must follow, it is more like a truth that when understood, can dramatically change your life. It’s sort of like the idea of gravity. When you understand how gravity works, you no longer expect that something you throw up into the air will stay up there. It’s just a given that because of gravity, it will come back down. The law of attraction says that what we experience in this life is the result of what we think, and how well we mange and direct our emotional vibration. This is an unusual way to think about ourselves – as vibrating – but because we are made of energy, and energy vibrates, we are all vibrating. The key, however, is to pay attention to whether or not your vibration is positive or negative. The reason this is important is because according to the law of attraction, the vibration you experience is like a magnetic force, and it attracts like-vibrations. Therefore, if your vibrational energy is negative, you will be attracting people, places and things that mirror back to you that same negative vibration. Think about the last time you woke up in a bad mood and how that sets the tone for the rest of the day. When you are not feeling well, your brain is more likely to notice how every stop light is red, and the car is almost out of gas, and the people at work are overwhelming you with demands, etc. When you wake up feeling great, the opposite happens, you are more likely to notice what a beautiful day it is, how easy it was to find a parking spot, how much you loved getting a phone call from a good friend, etc. 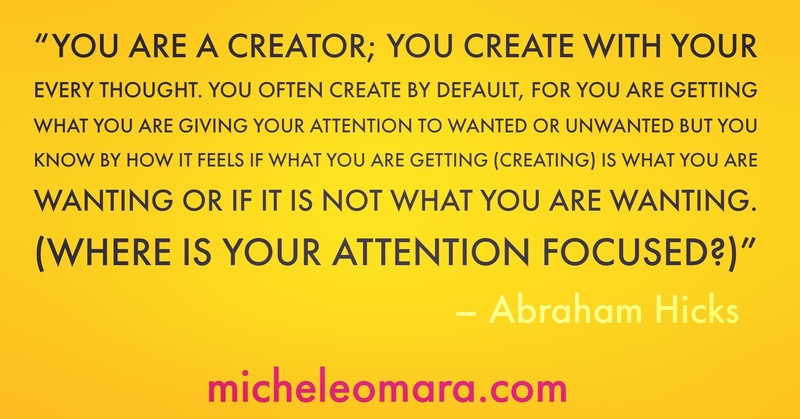 What is the law of attraction teaching me? The law of attraction teaches us that we are significantly more in charge of our vibration through our thoughts, and more powerful over our life experience, by paying attention to our emotions, than most people tend to exercise. While there are many different resources to teach you about the law of attraction, it is actually a very simple concept. What is difficult is developing a consistent practice, and fine tuning some of the skills involved in manifesting what you want, and keeping your mind on what is desired, rather than what is not desired. The catch is, you get what you think about it – regardless of what that is. If you think about what you want – you’ll get more of that. If you think about what you don’t want, you’ll get more of what you don’t want.